Ever wondered whether bread is bad for ducks? What about fish, vegetables, fruits, snacks or even food from other pets? In order to help you decide, we have compiled a list of different food items and whether it is a good idea to offer them to ducks or not. What Does a Duck Eat? Before diving into specific food items, there are some basic duck feeding aspects we would like to mention. In general, the best foods for ducks are those that provide the nutrients, minerals and vitamins a duck needs for healthy growth and development. Most of these foods are actually similar to what wild ducks will forage on their own (grasses, aquatic plants, fish, insects, …). Most of the food items mentioned below are to be considered as treats and should be limited to no more than 5-10% of a duck’s daily diet. 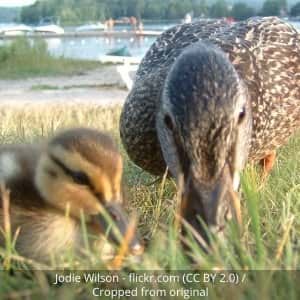 This is especially true for ducklings as birds grow much faster than for example we humans do. Without proper nutrition, problems can and will occur. A last important item we want to mention is that a duck’s digestive system works quite different from our own. Because of this, it is important for domesticated ducks to have access to fresh drinking water and grit (coarse dirt, pebbles or stones) as this helps them to digest their food. So what can ducks eat? Let’s dive into the list! What Can You Feed Ducks? Disclaimer: the list below is by no means exhaustive. If you’re unsure about feeding a duck a certain type of food, our best advice is to just not do it. While doing our research, we have tried to come up with a list of alternatives. If you know of other food items that your duck really enjoys let us know in the comments section below. If you are looking for information on a specific food item, use the below links in order to quickly jump to the corresponding page. This wraps up our list on what ducks can eat. What are your experiences with feeding ducks? Any food item we missed that you like to see covered?